High five for books! Round of applause! Quotation marks. What could be better to frame our favorite words? Rosie the Riveter Bookends. Girl Power! Available from Uncommon Goods, $34. 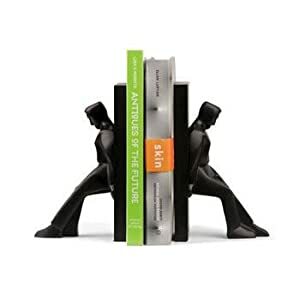 Leaning men bookends. Holding each other up? It is odd that they only show a few books in each shot. I like the hands the best.